All of the happenings on earth including previous and future events as well as human earthy affairs leave vibratory images in the ether. 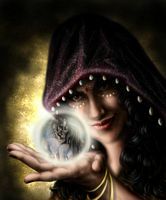 Those who posses a slight amount of psychic ability or power who have a sensitivity may tune in and see visual images or mental visions and is called clairvoyance. This is only made possible when the life energy of sight is adjusted to specific vibrations higher than those normally perceived with the naked eye. This happens mostly in the relaxation of sleep as the life force together with the intuitional power of the soul projects photographs of true-life visions giving a brief look at the fourth dimension. Those more advanced who have dissolved and banished their body identification with the ego can intuitively photograph any worldly scene in the wakeful state projecting the image on the mental screen of the mind by deliberately removing the life force from the muscles redirecting it to the point between the eyebrows which is also called the third eye or the spiritual eye. One cannot materialize a thought or see a vision without energy. This is how this universe was produced, energy with thought. We can create in the very same way small mental photographs. I personally have had colorful visions but not as a science or art that can reliably practice. I have had no control over producing them but I remember always at the time being in a very relaxed state in-between sleep and wakefulness. One may cultivate the technique of clairvoyance by increasing the vibration of energy or life-force and the perceptive or intuitional ability of the eyes. When the power is developed and strong enough it can pierce through anything even the astral world to see great saints. When a person is on that level he would also have the ability of clairaudience infrequently called intuitional hearing or clairaudio with the ability to listen to sounds from a great distance. Yet in analyzing the mind we find some people getting caught up in the subconscious states of induced dreams, psychic states, hallucinations and semi-superconscious dreams blocking their way by keeping themselves concentrated in the subconscious mind with subconscious pictures at a lower rate of vibration trying to get into a higher state of consciousness. This can be harmful to their spiritual growth where as real clairvoyance is favorable. It is impossible to jump start spiritually into a higher state without paying one’s dues. Two of the ways of developing the powerful state of clairvoyance is either being born with it by carrying it over from efforts in a past incarnation or by the guidance of a true guru who is not a teacher or self-appointed so-called master. Why are we so sightless that we need x ray machines to see through elements when we were meant to pierce visually through particular forms of matter as the technician peers through a microscope. I will explain. We have sold ourselves the thought we need technology to see behind the setting as if everything was lined with lead, the same as when the fictional character Superman was restricted from seeing through objects with his x ray vision. We don’t know what’s behind the scenes so we need help from all these instruments, appliances and machines due to hereditary restrictions of the mental processes that rule it. However, we were all given the power to develop our own visual ability to see the earth totally unlike from what comes into sight with our restricted physical vision. Our senses deceive us and do not tell the truth and if they did and we were to develop our own visual ability you would see this world as glaciers and rivers of electrons at a certain rate of vibration moving as a mass of light. The naked eye only tells us the most superficial properties of physical matter. By stimulating the power of the senses with the controlling power of the intellect the mind can photograph things via the eye the physical eye does not see. The power in the physical eye is even more powerful than an x ray but the unaided eye being undeveloped is lacking the high rate of energy to generate the necessary form of vibration to penetrate visually specific structures without the aid of instruments. We could not see through the microscope if the eye had no power, but in actuality the stimulating powers lies in the soul. It is the intelligence of the soul that develops the body and only because the soul has entered the body that it is allowed to develop. Why can’t any of you in meditation at Christmas time hear or see Christ? Can you hear or see TV images going through the ether of this material creation without the assistance of a television? No, spiritual restlessness and static prevents you from perceiving the highly delicate finer vibrations because your physical eyes and ears have to be attuned. Look within your forehead at the point between your eyebrows, Christ is right there. Heaven is the land of the 4th dimension the abode of angels and rays of light. Heaven is the astral region which is the cause that lies behind material things. The astral lands surpass human description with gardens of flowers made with vibrations of light. The glowing blossoms are never fading in a realm of hued rainbows, cascading fountains of prismatic lights; skies and seas have opalescent bright waves. The astral heaven is a luminous land of joy, freedom and incredible beauty in an atmosphere of well-being and love. You will find upon arriving in the pure clean beautiful astral world no weeds, insects or barren lands with snakes or offensive reptiles, but rainbow rivers and opal lakes. Our astral forms are never subjected to heat or cold but with an eternal spring and even temperatures. Do you know why you can’t see heaven or the heavenly forces? Do you see x-rays, magnetic or electronic rays? They are there though and so is heaven. We cannot perceive heaven because of its subtlety. From the teachings of PY.